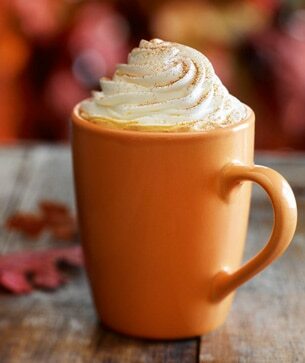 THE pumpkin spice latte. Gotta say I didn’t think it would have so much cream on it. With Halloween and autumn now both officially, the food focus is shifting towards root vegetables, spices, and anything generally warm, sweet, and comforting. Starbucks’ spicy pumpkin latte seemed to fit this bill, so I set off towards my local branch today in the hope of procuring one. I’d actually seen it advertised a week (or maybe more) ago, but with our branch having only opened this month, I was waiting for the crowds to die down. Unfortunately, they were all out of pumpkin spice latte – it would appear that the onset of autumn combined with a branch of Starbucks opening for the first time in an affluent, expat-heavy town was a bit too much for their suppliers to bear – leaving me to hunt elsewhere in the next week or two for a chance to sample one (a quick look at the Starbucks website reveals that the fabled drink is not so limited-edition as to no longer be on sale after Halloween). Perhaps the surprising part, though, is that I wanted to try the pumpkin spice latte at all. Why? I DO NOT LIKE MILK. I remember rejecting it even as a small child, scheming at playgroup to try to trade my milk for other children’s biscuits (ah, the 90s – they’re probably not allowed to give biscuits to three-year-olds in nurseries now). I also can still smell the warm, rubbery smell of the inside of the milk cup. BLECH. Today my calcium intake is probably still quite shocking. I love cheese, but somehow manage to ration the amount of it that I eat. I tend to eschew yoghurts for fruit purées at lunchtime, and I don’t even take milk on my cereal. I am not a fan of cream or custard in vast quantities. Tea and coffee is served BLACK 99% of the time. So anything that gets some calcium into me is probably a good thing. My love of pumpkin and spices could well override my general dislike of milk. Plus, I’m a grownup now, and grownups are supposed to be able to try new things without puking, right? So in the absence of the pumpkin spice latte at my local Starbucks today, what did I order? I could have gone for the fail-safe option of a cappuccino, but I instead decided to go out on a limb and order a chai tea latte, made with skimmed milk. I had never tried this and so was a little apprehensive: not just because of the milk thing, but also because a) I resent paying for tea outside the home [it’s a fricking tea bag!] and b) I thought it might be bland and that I could be disappointed. WAS I EVER WRONG. This hit the spot in terms of warm spiciness and only slight milkiness. Starbucks don’t give too many clues about what their blend contains, only mentioning cardamom, cinnamon and black pepper in a slightly coy manner. 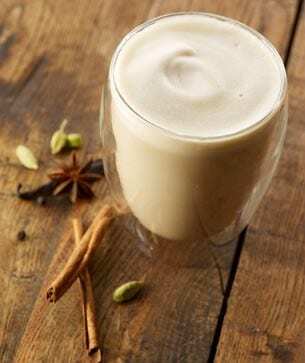 However, they do hint at chai’s Ayurvedic Indian roots, which primarily emphasises healing through the power of spice. However, a little bit of digging around online reveals that the traditional spice base (named Karha) must contain ginger and cardamom as a given, with many variations on this basic theme existing. Beyond those two spices, most traditional blends can contain any or all of the following: cinnamon, star anise, fennel seeds, peppercorns, or cloves. These add to the drink’s medicinal qualities, and the whole blend together is in fact known as masala (chai is just the Urdu word for tea, in fact). Suffice it to say that once the spices and tea are mixed, and then sweetened and mixed with steamed milk, the whole concoction is bloomin’ lovely. To continue the spice theme, I had a cinnamon swirl. Essentially a Danish pastry, this too was packed with flavour, thanks mainly to the sweet icing and the generously packed cinnamon that twisted throughout the curled bun. The sultanas were a little bit lost in amongst all of this, but I can forgive that. I don’t go to Starbucks that often (maybe two or three times a year), so it sounds a little sad, but this trip was a real treat. Throw in the Adrian Mole book that I’m reading, and I was HAPPY. Faceless global corporation? Maybe even that was challenged by the staff’s friendly and festive demeanour in my local branch today (and this is in France, where they REALLY don’t ‘do’ Halloween). Expensive? At €6 for a chai tea latte and a cinnamon pastry, not hideously so. And tasty? Absolutely. What’s that they used to say about spicing up your life…?